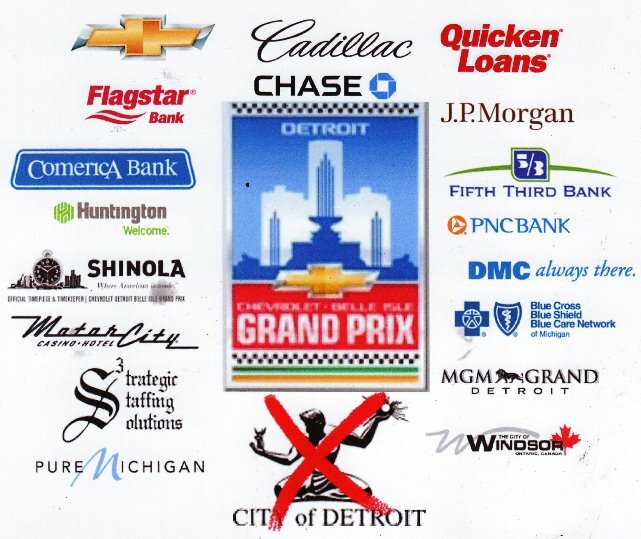 Detroit Belle Isle Grand Prix sponsors DO NOT include the City of Detroit, or benefit its residents. 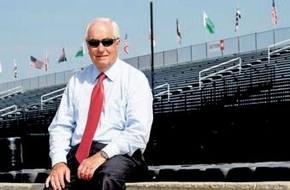 Roger Penske, king of the Detroit Belle Isle Grand Prix and CEO of a multi-billion dollar corporation. May 25, 2013 — Since at least March, Roger Penske and his allies in the banking and corporate sector have seized control of a large section of Detroit’s world-renowned Belle Isle, banning public access and despoiling the island’s natural beauty, all to prepare for the “Chevrolet Detroit Belle Isle Grand Prix” June 1 and 2, 2013. Penske is chair of Detroit Belle Isle Grand Prix, Inc. (DBIGP), a non-profit which claims in its IRS filings that it “1) promotes the revitalization of economically depressed areas of the City of Detroit by conducting motor vehicle racing and 2) raise[s] funds for the preservation and improvement of Belle Isle Park.” Therefore it pays no taxes. Jennifer Britt, whose family including children and uncle were foreclosed by Flagstar Bank after the death of her husband. DBIGP’s Form 990 for 2009, the earliest available on Guidestar, indicate that revenue for 2008 was $10.6 million, with expenses of $11.3 million. There is no declaration of any expense paid to the City of Detroit for rental of the island or the use of public employees from the recreation, police, fire and other departments. 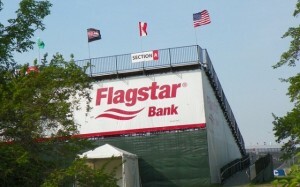 Flagstar Bank, one of many banks and corporations sponsoring the Detroit Belle Isle Grand Prix. Flagstar put Jennifer Britt among thousand of others out of their homes, and was featured in protest signs at the May 4 rally for a moratorium on Detroit’s debt to the banks. Detroit’s overall economic condition declined from 2007 to 2008, according to the city’s Comprehensive Annual Financial Statements for 2008. In 2008, the city had a total general fund defict of $219 million, up from $155.6 million in 2007. So evidently the city as a whole did not benefit from the races Penske held in 2007 and 2008. 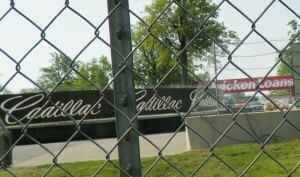 Cadillac and Quicken Loans on fenced-off race course. A city budget involving projected city revenues and expenses for the Grand Prix. A copy of the contract(s) with Detroit Belle Isle Grand Prix, Inc. and any related agencies such as the Downtown Detroit Partnership, both non-profits, involving use of city-owned public land on Belle Isle for the event. A complete list of charges to the event’s sponsors from the City of Detroit for allowing the presence of this event on city property, e.g. rent, charges for use of police, fire, recreation and other city personnel during and around the Grand Prix, to prepare for the event, to operate it, and for shutdown. A list of what improvements to Belle Isle that Detroit Belle Isle Grand Prix, Inc. has made or plans to make to the island, pursuant to its report to the IRS . . . The cost of those improvements or planned improvements, projected for this year, and during past Grand Prix events. The amount of funds the company has contributed to the preservation and improvement of Belle Isle for this year’s race, as well as previous races held on the island. 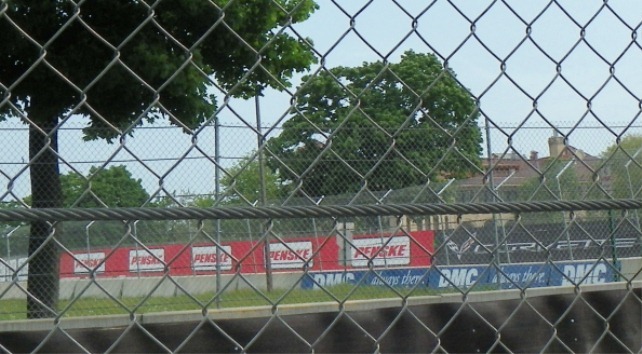 Fences and barricades protect the wealthy coming to see the Grand Prix. Here, signs for Penske Corp. and the DMC, which just laid off hundreds of workers after Vanguard Health Care, 70 percent owned by a Wall Street hedge fund, took it over as a for-profit chain. Current Detroit Mayoral candidate Mike Duggan, who was DMC CEO and led the charge for the Vanguard takeover, bailed out just before the disastrous lay-offs. Patients have reported difficulty in obtaining care since the takeover, according to advocacy groups. There is no indication the situation will change this year, even though Detroit is in such dire distress, running a deficit allegedly exceeding $360 million, that Emergency Manager Kevyn Orr flew in on vulture wings to save the city. 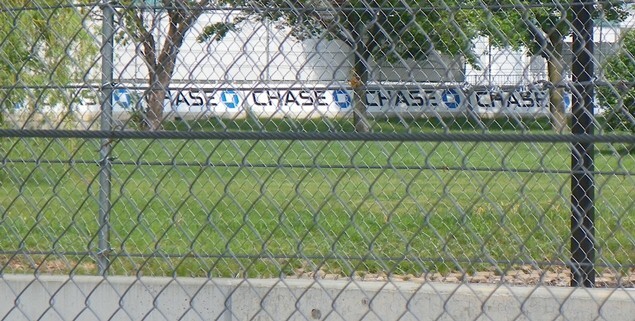 During a bicycle tour of the island May 21, this reporter took photos of sponsor signs on the raceway from the same banks and corporations which have devastated Detroit with predatory lending to its residents and government, as well as massive illegal foreclosures that have driven 275,000 people out of the city. Chase Bank, which counts itself among many of the City of Detroit’s creditors, and has also been responsible for thousands of foreclosures in the metro area and nationally. The entire section of the island west of the police station near the beach was cordoned off, looking like a “concentration camp for the wealthy,” considering three-day ticket prices of up to $155 for adults and $110 for children. The photos were taken through fences and barbed wire, over concrete blockades lining the raceway, as no other access was available. 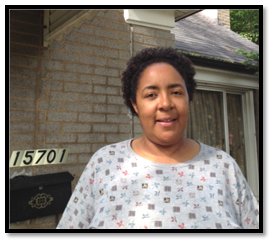 Alma Counts, an 82-year-old Detroit stroke victim, faced foreclosure by Chase after it refused to honor a modification granted by the original owner of her mortgage. A guard said the public could not even walk on the grassy side of the island next to the river on the other side of the barricades. Fences were set up from the barricades all the way to the water. Photos were taken anyway after the reporter slipped though an open gate, which was locked on her way back, forcing her to straddle the fence in the water to get back to her bike. A pair of geese and poor little goslings, not yet able to fly, were however trapped by that fence. Wildlife on the island has been traumatized by destruction due to the races and other incursions on their native habitat for years now. Recently, another family of geese with babies was seen crossing East Jefferson against the traffic. dodging cars, clearly having been displaced from their original nesting place on the island. 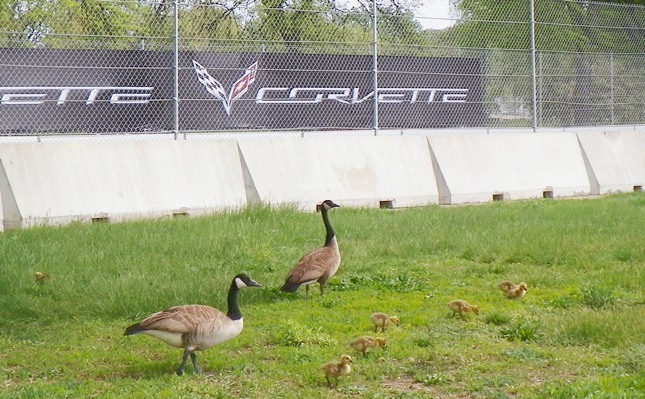 Geese and baby goslings were trapped by fences outside of barricades. Fence blocking public access all the way to the river itself. Signs for Dan Gilbert’s Quicken Loans dominated the island as well. The wealthy mortgage baron, worth $1.9 billion, also owns the Cleveland Cavaliers. 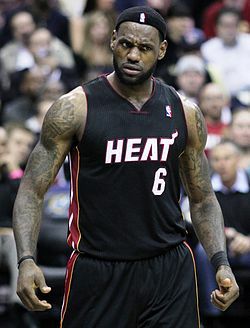 He was fined $100,000 by the NBA Commission for remarks he made criticizing LeBron James’ decision to leave the Cavaliers for the Miami Heat. The Rev. Jesse Jackson said Gilbert’s feelings “personify a slave master mentality,” and that he was treating James as “a runaway slave”. The Quicken Loan headquarters in downtown Detroit migrated from the virtally all-white Detroit suburb of Livonia, also the home of current Mayoral candidate Mike Duggan until he moved to Detroit less than one year before he filed to run. Gilbert is competing with Mike Illitch, worth $2.7 billion and owner of the Detroit Tigers and Red Wings, to buy up huge tracts of land in downtown Detroit and the Cass Corridor at bargain basement prices. 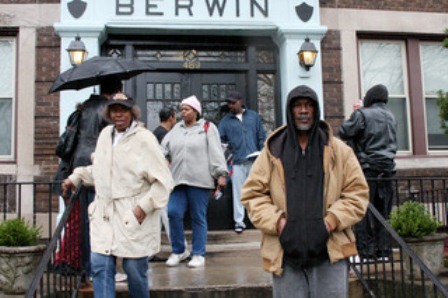 Residents of Berwin Apartments in Detroit’s Cass Corridor, evicted by mystery buyer who may be Dan Gilbert. It’s a toss-up which of them is responsible for the recent eviction of extremely low-income residents of three apartment buildings on Henry. 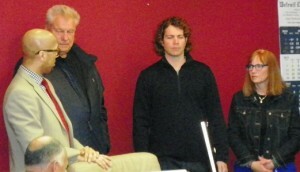 Both have plans for the area, urged on by the appointment of EM Orr. According to a recent New York Times article, Gilbert has spent around $1 billion acquiring nearly three million square fee of real estate, and is negotiating to buy the Greektown Casino Hotel. Earlier, he bought the historic Dime Building in downtown Detroit for a paltry $15 million. 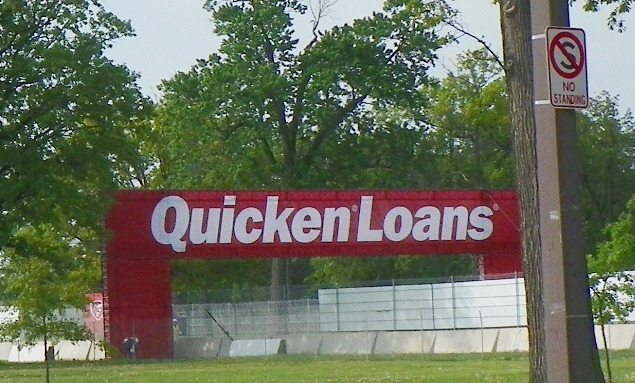 Dan Gilbert’s Quicken Loans is one of the DBIGP’s sponors. The billionaire may be responsible for the recent evictions of hundreds of poor folks in the Cass Corridor. The Chevrolet Detroit Belle Isle Grand Prix is of course also sponsored by Chevrolet, Cadillac and Corvette, brand names of cars manufactured by that great ally of Detroit’s population, General Motors. 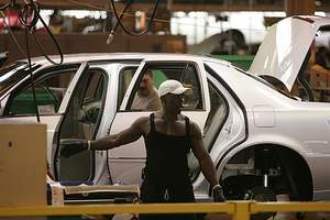 GM auto worker before massive lay-offs hit. After devastating the city of Detroit with plant closures through the 1980’s, GM closed 14 factories across the U.S., including seven in Michigan, as part of its bankruptcy and government bail-out/restructuring plan in 2009. Of the company’s remaining 62,000 hourly workers, 21,000 lost their jobs. Those closings further devastated the majority-Black city of Pontiac, which now also struggles under the whip of an EM, who has sold off a large amount of the city’s assets, including its 11 water department plants. The company has gone on to close plants, most recently in Flint, another majority-Black city run by an EM. It has also hit suburban plants throughout Michigan and the country. 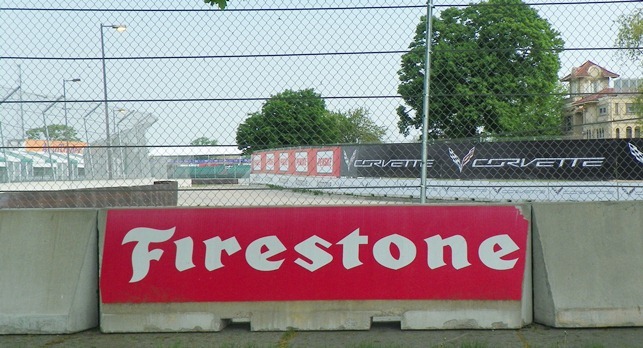 Firestone and Corvette signs adorn the barricades at the 2013 DBIGP. MGM Grand and Motor City Casino banners were prominent at the DBIGP concentration camp for the wealthy as well. While the casinos have provided jobs for some grateful Detroiters, they have also impoverished a great many more who have become gambling addicts. Motor City Casino proudly sponsors the DBIGP as well. Additionally, Detroit’s tax revenues from those casinos now go directly to U.S. Bank NA, which acts as a trustee to make sure its debts to the banks get paid off from that income. The primary creditor is UBS AG, which loaned the city a whopping $1.5 BILLION in pension obligation certificates in 2005, a predatory loan which the city defaulted on twice after the global economic collapse of 2008, costing it another $1 billion in fines. 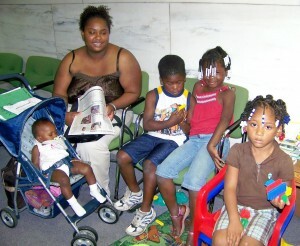 Improverished family waits for housing assistance. Despite those factors, the Rev. Wendell Anthony, head of Detroit’s NAACP chapter, recently held its membership meeting at the MGM Grand Casino hotel. Earlier, after hundreds of thousands of Michigan residents, mainly women and children, were thrown off public assistance, the Rev. Jesse Jackson of Rainbow PUSH came to Detroit to join a protest by the Michigan Welfare Rights Organization. He refused, however, to call a boycott of Michigan businesses and proceeded to hold a Rainbow PUSH Automotive Summit at the same hotel the next week, attended by auto executives from across the globe. 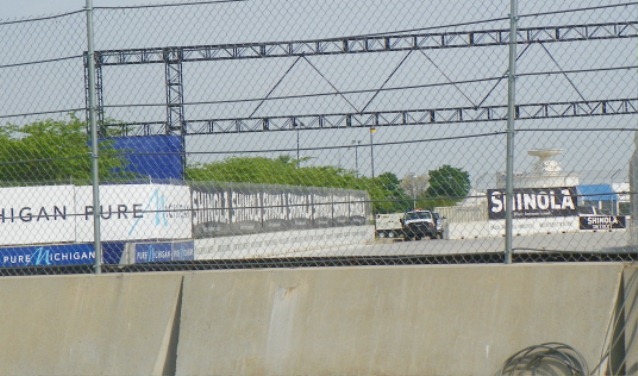 Shinola sponsorship signs on raceway. A newcomer to the Grand Prix sponsorship is Shinola, LLC, a white-owned start-up company given an award by City Council President Charles Pugh at the beginning of its session April 9, 2013. The company evidently has quite a bit of money available, since its signs, next to the historic Dodge Fountain, also blocked from public access, were as prominent as those of the major corporations. Charles Pugh with partners of Shinola, LLC, including CEO Randy Montgomery (3rd from left) at City Council meeting April 9, 2013. Shinola CEO Randy Montgomery and his partners are making watches, bicycles and other paraphernalia at the College for Creative Studies, but have not said how many Detroiters they are hiring. 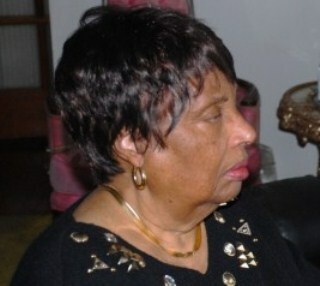 Pugh said he met Montgomery at a meeting of the Detroit Economic Growth Corporation, a corporate front for privatization. The company bought the rights to the name from the makers of Shinola shoe polish, which ran racist ads featuring a Black child shining shoes. The daily media is currently running outraged articles regarding EM Orr’s alleged announcement that paintings and other art at the Detroit Institute of Arts, which are owned by the City, may be sold to pay off the city’s debt. They make no mention of the earllier loss of actual human beings, city workers who lost their jobs when the DIA was handed over to the management of the Founders Society, run by wealthy suburbanites. 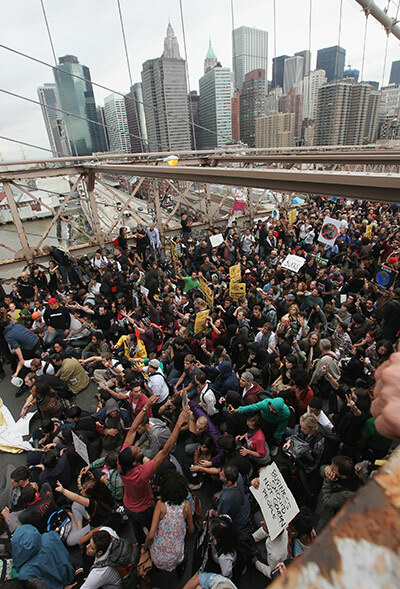 OCCUPY WALL STREET PROTESTERS BLOCK THE BROOKLYN BRIDGE IN NEW YORK CITY IN 2011. It is more likely that treasures like Belle Isle, which is used primarily by Black Detroiters, particularly Black youth who have few other places for recreation, and the Detroit Water and Sewerage Department, run across a six-county area largely by Black city workers, will face the EM’s ax if Detroiters do not rise to defend their home. 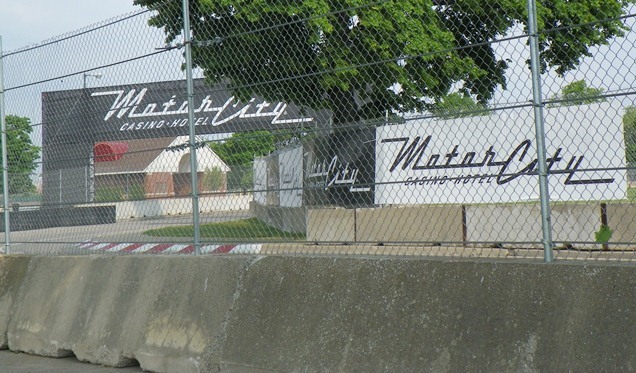 VOD RECOMMENDS THAT DETROITERS AND THOSE WHO SUPPORT THEM BOYCOTT THE GRAND PRIX TO PROTEST THE EM TAKEOVER OF THE CITY. DO NOT ATTEND THE FREE DAY WHICH GIVES THE DBIGP THE OPPORTUNITY TO SHOW OFF BLACKS IN ATTENDANCE, WATCHING WEALTHY WHITE RACE CAR DRIVERS. DO NOT VOLUNTEER! DETROITERS NEED PAID JOBS! CONDUCT A MASS PROTEST AT THE BRIDGE! BLOCK TRAFFIC! INTERFERE WITH COMMERCE! SAVE OUR CITY! Are you saying that the City Council should not be taking any blame for Detroit’s plight? You try to hit the race card here I am 100% sure there are people from all walks of life that enjoy racing. The way you wrote this was so biased and slamming race fans that it makes your point completely invalid. You do realize the Indycars ran in 2012 right? Get your facts straight. You are correct. I apologize for the error. I will update the article to see if Detroit earned any revenues during the fiscal year of 2012 from the race. The most recent Forms 990 from the DBIGP, of 2011, do not show any expenses paid to the city, as mentioned in the article. As a black man living in Detroit, I am appalled at the amount of racism in this article. I am embarrassed and all my brothers and sisters should be as well. You need to explain exactly what you mean by racism. My understanding of racism is the system created by white supremacy, i.e. wealthy whites, based on the genocide of the people who first lived on the continents of the Americas, and the subsequent genocide of Africans kidnapped from their own lands, millions of whom perished during the middle crossing.The economic system was then built on the profits of slavery. It continues to profit from the military-prison-industrial complex which disproportinately incarcerates people of color and sends them to their deaths as they slaughter people of color in other countries, for the profits of wealthy whites. Give me yours please. I thought they raced on BI last year? Roger Peniske has done more damage to Belle Isle than anyone in the last 150 years. He paved 10 acres of prime green space and then gave King Kwame $60,000 as a thank you gift. Let him buy the land between Kercheval and Mack bordered by Conner and Chalmers, build a pemanent track, set a house on fire during the race and call it the Keeping It Real Detroit Grand Prix. Where do we meet to barricade the bridge on racist race days? THE ARTICLE IS RIGHT-ON!!! NOT ONLY ARE DETROITERS INCONVENIENTLY, INCONVIENCED FOR MONTHS PRIOR TO THIS RACE THAT IS “VERY DESTRUCTIVE” TO OUR “NATURAL PARK, BELLE ISLE”!!! WE SHOULD NOT HAVE TO ENDURE EACH YEAR “RESTRICTIONS” AND “DESTRUCTION” OF “OUR LAND” TO PROVIDE RECREATION TO A FEW PEOPLE WHO DO NOT LIVE HERE AND LOOK AT DETROITERS AS A “SUB-CULTURE OF RESIDENTS” WHO WILL ONLY EXIST WITH THE “GOVERNANCE OF AUTHORITIES” (TREATIES) MADE UP OF OUTSIDERS EVEN IF THEY PLACE A FEW PERSONS ON THESE BOARDS WITH SKIN COLOR, THESE RESIDENTS WITH or WITHOUT COLOR IN THEIR SKIN HAVE NO VOTE OR SAY IN THEIR OWN “GOVERNANCE” AND WE ARE ALL TREATED AS IF EVERY DETROITER IS AN “ILLEGAL IMMIGRANT”, “THE STATE and CITY GOVERNMENT” DISOLVING ALL OF THE RIGHTS GRANTED TO “US” UNDER “THE CONSTITUTION of The UNITED STATES of AMERICA”?? REMOVING MORE AND MORE OF THE GRASSES AND TREES, REPLACING THEM WITH “CONCRETE STRUCTURES” and “BLACK TOP” WILL IN TIME INCREASE THE “NATURAL TEMPERATURE” OF THE ISLAND TO THE DISCOMFORT OF BOTH “PEOPLE” and “WILDLIFE” ON THE ISLAND. THE COMMING “ROCK CONCERTS” TO THE ISLAND WILL EFFECT “THE HEARING RANGE” (Deafness) LONG AFTER THE PARTIES AND CONCERTS ARE OVER AND SINCE MANY, MANY MUCH “WILDLIFE” DEPEND ON “THEIR HEARING RANGE” TO “HUNT” and “PROTECT” THEMSELVES, WE WILL SOON SEE A CHANGE IN “THE NATURAL SPECIES” THAT HABITATE ON THE ISLAND. IF A SPECIES CANNOT HEAR IT’S ATTACKER IN TIME TO PROTECT ITSELF THAT SPECIES WILL SOON “DISAPPEAR and PERRISH”. BEING “TONE DEAF” IS NOT GOOD IF YOU LIVE IN “THE WILD”!!! SO PLEASE SAY “NO” TO “LOUD ROCK CONCERTS” THAT DO NOT BENEFIT DETROITERS FINANCIALLY, OR SOCIALLY. THE “LONG TERM EFFECTS” OF WHICH CANNOT BE CORRECTED WITH AN “EMERGENCY MANAGER”, or “AUTHORITY”. HUNDREDS OF YEARS AGO “CADILLAC” SAILED UP THE “DETROIT RIVER” IN TOTAL WONDERMENT OF THE BEAUTY OF “THE NATURE” AND “THE WILDLIFE” THAT FLOURISHED HERE IN “DETROIT”. HIS ONLY ARGUMENT WAS THAT THE LAND WAS NOT BEING “PROPERLY UTILIZED” BY “THE ABORIGINAL SPECIES” THAT LIVED HERE ?? THAT LEAVES ONE TO QUESTION?? IF A SPECIES CAN INHABIT A REGION FOR “THOUSANDS OF YEARS” WITH NO “PROPERTY TAXES” AND THE AREA REMAINED SO BEAUTIFUL THAT “Mr CADILLAC” HAD TO SEND NOTE TO “THE KING” TO “BRAG” ABOUT WHAT “HE” HAD DISCOVERED??? DETROIT WAS NEVER DISCOVERED!! MY PEOPLE HAD BEEN HERE FOR “THOUSANDS OF YEARS” AND WERE VERY GOOD AT TAKING CARE OF “OUR LIFE”, “LAND” AND OUR “PROPERTY”??? P.S. “I” AM ‘NATIVE AMERICAN’ (Black Feet Indian), “AFRICAN AMERICAN”, and A LITTLE “EUROPEAN” TOSSED IN THERE.